Excel in the company of giants. The $112 billion equine industry is booming. William Woods University makes you a marketable and prepared candidate for a multitude of careers within this industry. A successful manager not only manages horses in a superior manner, but is an effective leader and manager of people. Equine administration students learn equestrian business skills such as entrepreneurship, business communications, and managerial strategies. These are combined with our traditional approach to horsemanship in the four disciplines of Dressage, Hunter/Jumper, Saddle Seat, and Western. Get involved with other students who share your interests through the five equestrian organizations on campus, open to all students, regardless of major. There is a club for each seat: Dressage, Hunter/Jumper, Saddle Seat, and Western. Each of these clubs has its own personality and activities, and they all promote camaraderie and learning through horse shows, service events, and professional competitions. There is also an intercollegiate Competitive Judging Team, open to anyone who wants to learn more about horses and competitive judging. This team travels to regional judging competitions each fall and helps at regional clinics and judging contests each spring. We also host a variety of shows on campus throughout the year. In addition to instruction from our own nationally renowned faculty members, you will learn from top industry professionals in various clinics and seminars. Clinicians include Smith Lilly, Richard Shrake, Ann Judge, Jeff Cook, Melanie Smith-Taylor, Betsy Steiner, and Pierre St. Jacque. Field trips include visits to area professional horse training facilities, the Veterinary School at the University of Missouri, horse shows, and museums. Special courses have given students the opportunity to tour show horse barns in Kentucky and Missouri, ride with professional horse trainers in Oregon and Hawaii, and tour and ride in famous horse facilities in England and France. Faculty have taken students to volunteer at horse shows including the U.S. Dressage Finals at the Kentucky Horse Park. 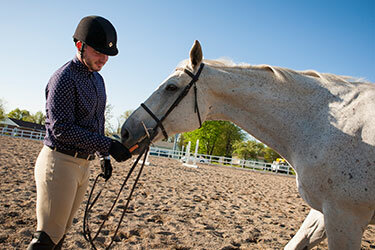 Few educational institutions can match William Woods University for its on-campus equine facilities that accommodate riding, care and study at all levels and seats. Our classrooms include an extensive video library and viewing equipment, and our dedicated library includes more than 1,000 books on all aspects of the field, from history and physiology to behavior, training, law, and competition. Our more than 150 horses represent the most popular breeds and are cared for by William Woods students and our full-time, on-site veterinarian. Our large, modern equestrian complex that will provide you with an excellent educational experience in both classroom and the field. The list of opportunities within equine industries and business organizations is endless. Or, pursue graduate school in equestrian education, business and more. My proudest moments are when our students graduate and go onto jobs within the industry. I am proud that I had some small part in their future. My proudest moment working in this program would have to be seeing my graduates go out in the industry and make a difference. I have graduates that own their own facilities and train show horses for amateurs of all ages. It is such a proud moment when the students walk across the stage at graduation to see how much they have matured since they came to William Woods University … and then to see them succeed in the business is just incredible. The Bachelor of Science in Equine Administration degree at William Woods University consists of 122 distinct credit hours for graduation—including 49 core major credits and 3 required riding elective credits. This hands-on digital video production course is designed for beginning level students. Students will be introduced to basic equipment, techniques, and theories of digital filmmaking. Students will gain a fundamental understanding of the pre-production, production, and post-production skills associated with digital filmmaking. This course will look at the daily operation, methodology and practice of equine facility management. It will introduce the student to how equine facilities are organized, how they operate and give the student hands-on experience in these areas. Topics related to the equine facility operations will be covered. This course will introduce the student to developing the techniques, working skills and habits of a professional equestrian. Managerial positions require the individual to be a self starter, to have the self discipline to establish and maintain their own work schedule and the perseverance to see the job to its completion. Those skills will be practiced in this class. Students will explore the equestrian majors and minors offered at WWU as they relate to employment, graduate school, and other career goals. Developing an equestrian program plan will be a focus of the course with emphasis on identifying suitable careers for each program. An introduction to the required proficiency test sequence and senior portfolio will be presented. This course is an introduction to equestrians and horse organizations and their objectives including the extent of horse sport on the national and international level. The role of the horse in today’s society will be explored. The four WWU disciplines of Dressage, Hunter/Jumper, Saddle Seat and Western along with their respective practices will be surveyed. Points concerning horse behavior, care of the domesticated horse, developing a professional lexicon and the importance of proper fitting and uses of basic tack will be covered. The course will also explore employment opportunities and practices in the industry. 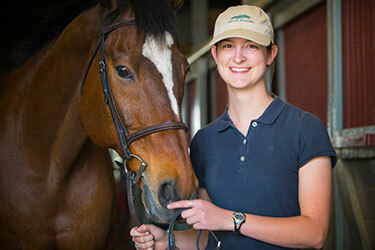 Students will explore management and treatment protocols for performance horses. Identification and administration methods and dosage for equine drugs and medications associated with the competition or working horse will also be addressed. Equine infectious diseases, injuries, illnesses and complications are a primary focus of the course. 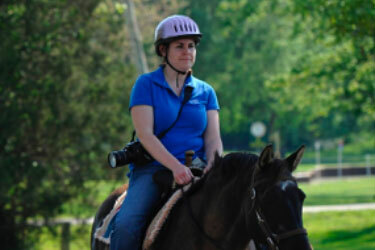 This course is a comprehensive overview and introduction to teaching methods and learning styles as they apply to an equestrian program and learning environment. 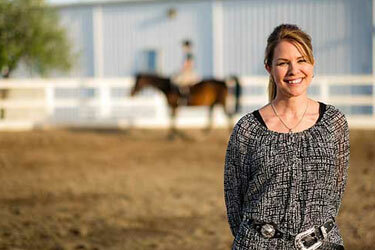 Students will explore the many opportunities within the equestrian world for a start-up business. They will learn how to research and collect the data and then turn that into a plan for a startup business focusing on organization, management and the financial requirements. An applied management course emphasizing the further development of the skills necessary for the day to day care of horses. All aspects of the daily care and health management of a larger string of horses will be practiced. (Required grade of C or higher to satisfy major requirements - must be taken before student accumulates 90 credit hours.) Prerequisites: EQU 201; passed with C grade or higher. 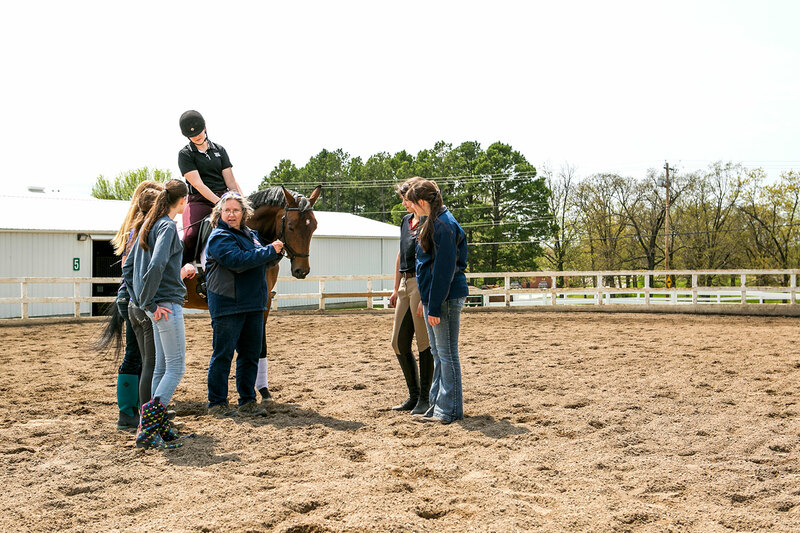 As is the hands-on nature of William Woods equestrian programs, this 17-acre property enables students to practice and observe various equine health procedures hands-on.